Crocosmia are red-to-orange glad-like flowers for the summer. Crosomia is a South African version of a gladiola. Fill your containers with good quality, well-drained soil. Almost any commercially available potting medium will work fine. Make sure there are adequate drainage holes; crocosmia corms must not sit in waterlogged soil or they risk rotting. Feel free to mix crocosmia with other plants in the same container. Just keep in mind that all must have the same light and water needs. Plant the corms 2″-3″ deep and 8″ apart. Place them with the pointy end facing up. 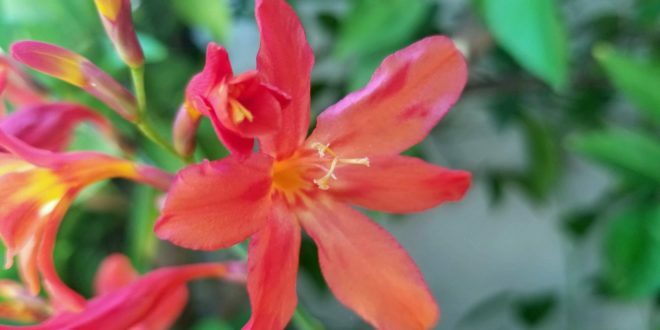 After planting, water your crocosmia generously to settle the soil around the corms. Roots and sprouts will form in a few weeks, depending on soil and air temperatures. If temperatures are still cool in your area, wait until they warm before planting. Crocosmia need heat to get them going and can be slow to sprout. When in bloom, feel free to cut crocosmia flowers for bouquets. The arched sprays add colorful highlights and varied flower forms to arrangements. Snipping flowers will not hurt your plants. After blossoming has finished for the season leave the foliage in place, don’t cut it off. The leaves gather sunlight and provide nourishment for next year’s show. Water as needed. Leaves may be removed when they yellow. Your crocosmia will rest for a few months before beginning the next growing cycle in spring. They have colourful inflorescences of 4 to 20 vivid red and orange subopposite flowers on a divaricately (horizontally) branched stem. The terminal inflorescence can have the form of a cyme or a raceme. These flower from early summer well into fall. The flowers are sessile on a flexuose arched spike. The fertile flowers are hermaphroditic. All stamens have an equal length. The style branches are apically forked. They are pollinated by insects, birds (hummingbirds) or by the wind. The dehiscent capsules are shorter than they are wide.